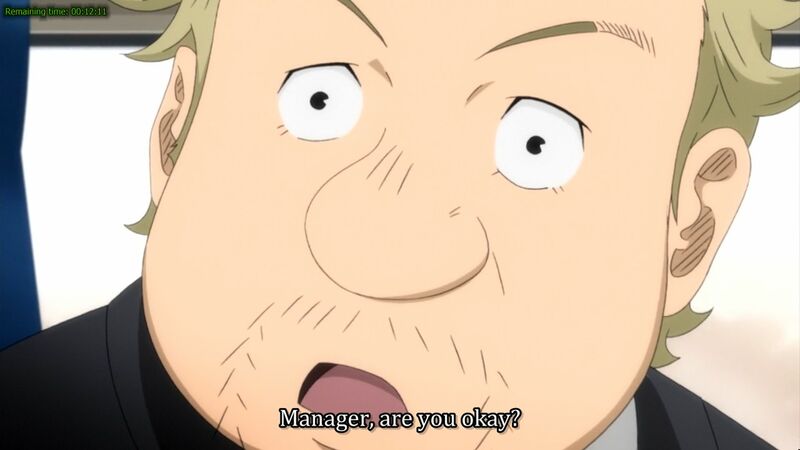 The Mourinho-like main protagonist, also one of the best characters in this anime. 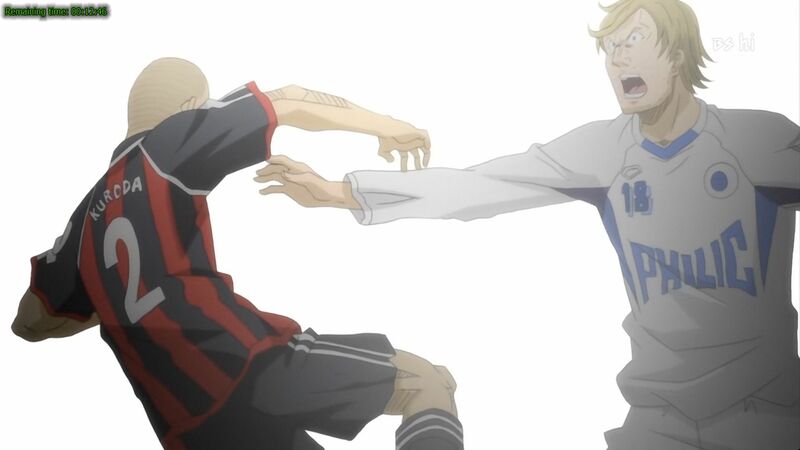 It has been quite some time since I reviewed a sport genre title in this blog (the last one is for Ookiku Furikabutte S2 in August last year), therefore today I will review one of them in the form of the deceptively-titled Giant Killing, an anime about soccer football management. And because this is a sport anime title, the sport genre handicap will also be applied here, as usual. This is a surprisingly solid 2010 title, therefore will we see a new successor to Katanagatari as the new ‘Anime of the Year 2010’ holder? You will know the answer after reading the whole review. And this is him with the club’s mascot. After scaring Portsmouth FC shitless during the round of 32 of the FA Cup, our main protagonist returns to Japan and take the reins of the fictional J-League team East Tokyo United (ETU), a small team where he has a spell as a player in the past. He then used his somewhat unorthodox managerial abilities to push the underachieving football team up the ladder against the established teams of Japanese footballing world. Actually, when I first downloaded this anime, I literally thought that the title explained itself story-wise, where a bunch of adventurers are trying to kill giants to protect the local village/township/kingdom/continent/world, in a setting like the one in The Sacred Blacksmith. Instead, what we got here are ‘giant killings’ that can be epitomized in last night’s Birmingham’s win against Arsenal in the 2011 Carling Cup Final (I finished watching this anime mere hours before that game started) or to a lesser extent (and probably more relevant), when Wolverhampton Wanderers defeated Manchester United earlier in the 2010 –2011 league season. If there is an award for misleading titles, this anime is certainly a shoo-in candidate for it. But this is not a negative point aspect for this anime at all. 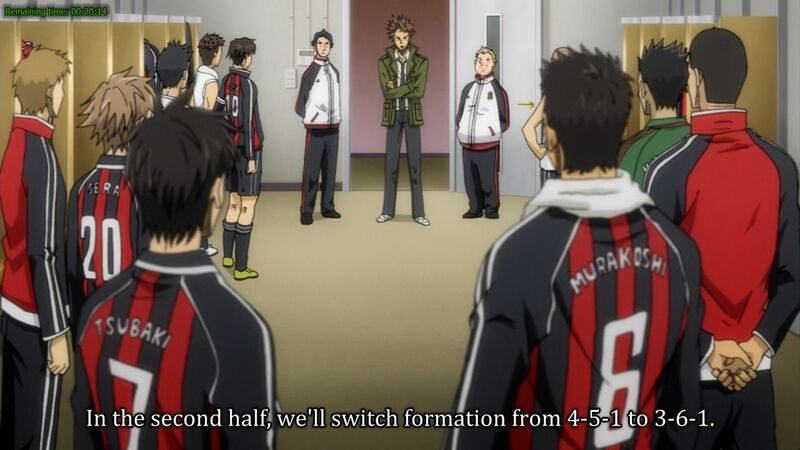 The story itself is quite unique for its genre, mainly because the main character doesn’t play the game portrayed in this anime, instead he is only the coach/manager of the team. Maybe there are other sports manga/anime titles that is alike to this one, but this anime is the first ever title I watched that uses such a premise. Plus, while the main character himself is the schemer of the tactics and strategies and not the executor of those plans, you must have thought that he is a scheming genius in the mould of main protagonists of One Outs and Akagi. But that isn’t true either, which not only made this anime more believable and accessible, but also less predictable than most of its peers. In addition to that, this football anime doesn’t involve the usual middle/high school football team trying to qualify to the nationals, but this anime can still be qualified as a shounen, unlike One Outs is. In short, this anime has a very solid plot. You can see the main protagonist handle the dysfunctional team members, the media, the board room and also the club’s Ultras too. There is also some influence from that 'Dream Team' drama series too here. Another plus point for this anime is there are no romance at all in the storyline. No distractions at all for the main protagonist as he worked his magic on the hapless relegation-threatened East Tokyo United. 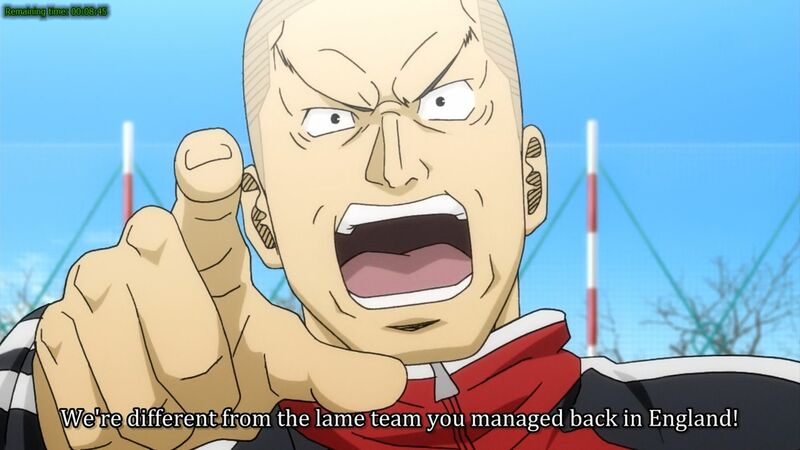 …but only this bald center-back, also one of the best characters in this anime, dares to publicly air his justified grievances about the new manager. 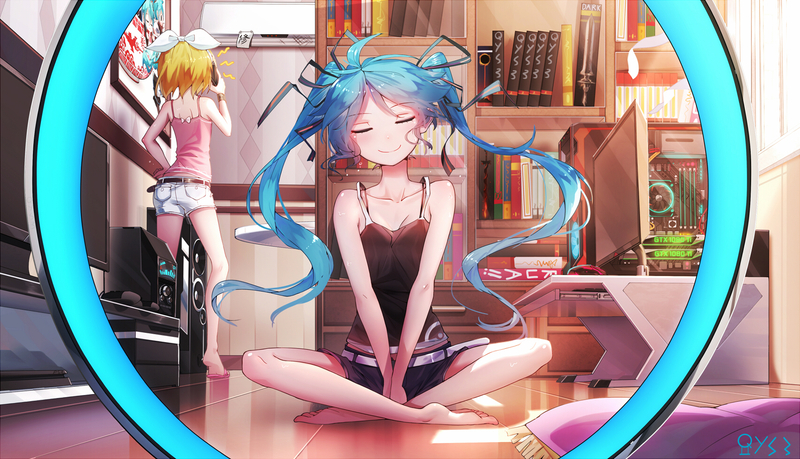 For presentation, the pacing of the story of this anime is slow, mainly because of the nature of the story. The flow of the story is flawless though, with absolutely no transitions problems unlike the previous anime reviewed here before this one. Also unlike many sports manga/anime out there, there are no over-the-top over-exaggerated techniques either, which also makes this anime more realistic. Spoken foreign languages are common in this anime, and this anime performed much better in this regard when compared to the ‘poster boy of bad spoken Engrish’ in the form of Koukaku no Regios. 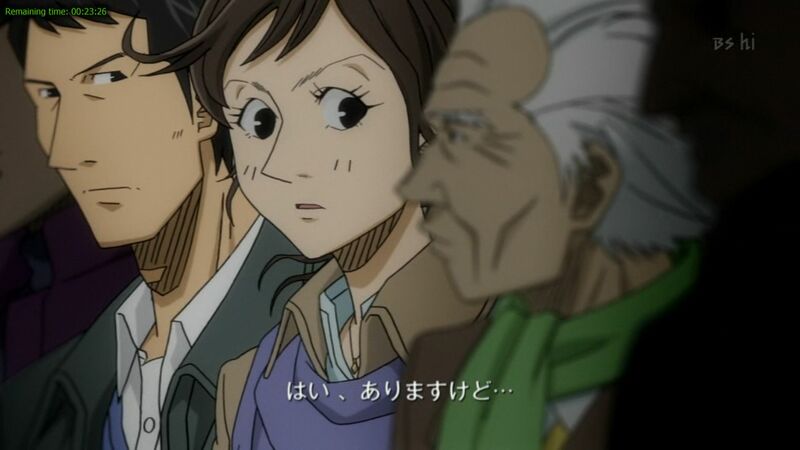 But the way Portuguese Brazilian was spoken in this anime has some Korean-dialect twang in it, which is quite funny. Foreign languages in this anime are spoken with reasonable quality. Excellent character developments is almost always one of the best traits that a sport anime title has, and this anime is not an exception. But actually, the main protagonist has static character development strategies, which means he is the same person from the first episode to the end. 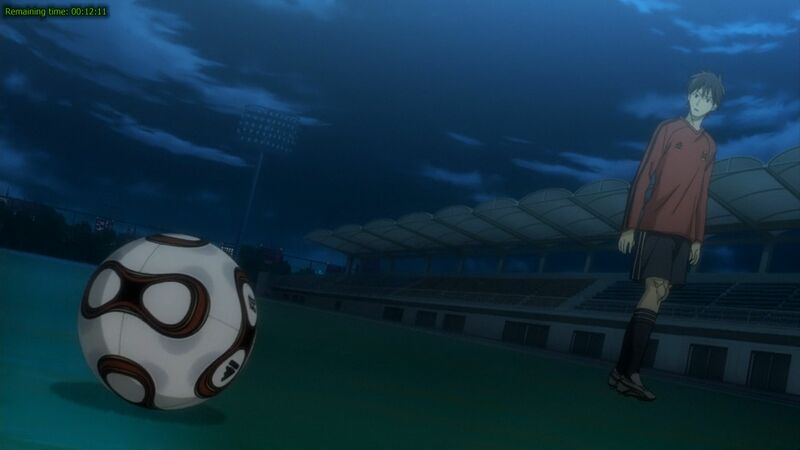 Despite of that, he is definitely one of this anime’s best characters, mainly because of his methods of coaxing the players in his football club to do things he wants without telling them his intentions in full. Some players benefits greatly because of this, causing them to have excellent character developments, such the no.7 midfielder and the bald center-back. 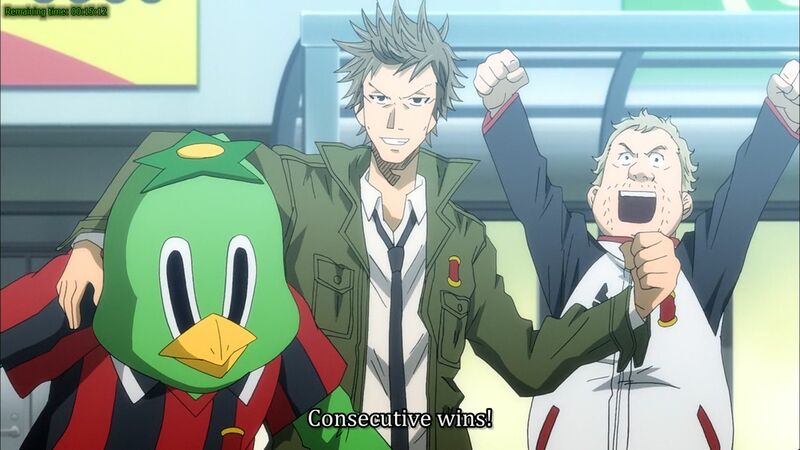 These two characters are also the best characters in this anime. Holy crap, is he channeling the current Kenny Dalglish’s Liverpool side? Still, you can plainly see that this anime is still unfinished in that aspect, therefore THIS ANIME NEEDS A SECOND SEASON. There are still huge amount of room for characters developments in this anime (especially for the no.11), and so are for the storyline. 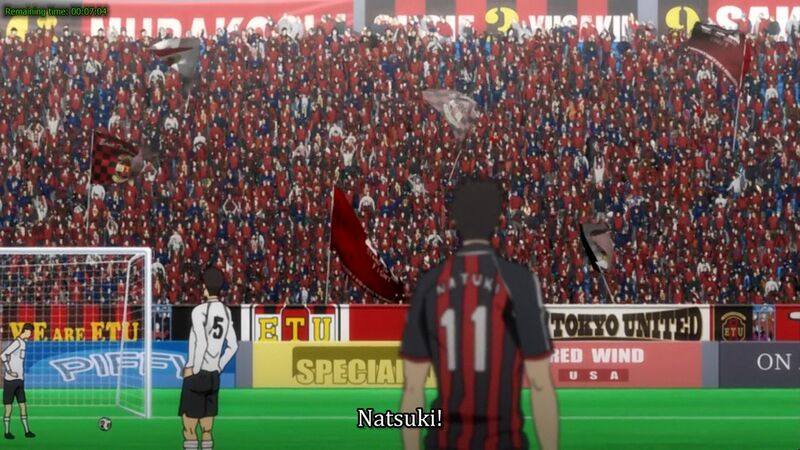 The football season in the anime is barely halfway anyway, and the club is still in the running in the cup competition. The ending is written to accommodate one anyway. If Sir Red Nose is the one who managed this East Tokyo United, and he sees his players dawdling on the field of play just like above, these two players will be substituted pronto, in advance of some hair-dryer treatments. Character designs in this anime is decent and most of the time, fits the characters that are portrayed. 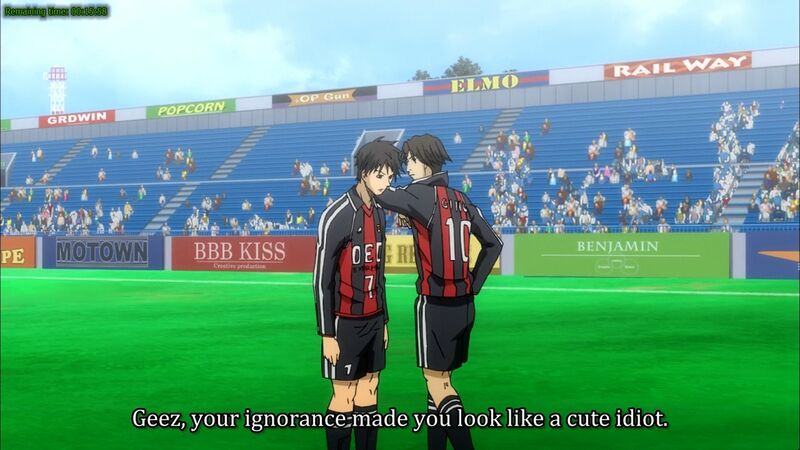 This really applies to the three best characters in this anime (the main protagonist, the no.7 midfielder and also the bald center-back). Black hairs are quite common in this modern Japan though. A positive aspect for this anime. The voice acting in this anime is decent, and not more. Only the bald center-back voice actor has something you can call a reasonable good gig. Nevertheless, there are no major weaknesses though, and as mentioned before, the foreign languages are spoken without those bastardization heard in Koukaku no Regios. 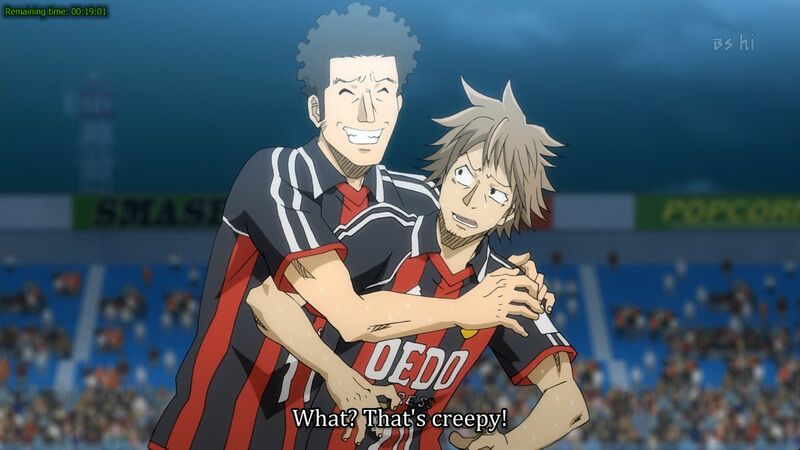 And that guy with a questionable name also perform some act of gayness ON THE PITCH! The OST is average, but the OP and ED themes (only one of each throughout the series) are excellent. The OP theme in particular is very catchy. A positive aspect of this anime. 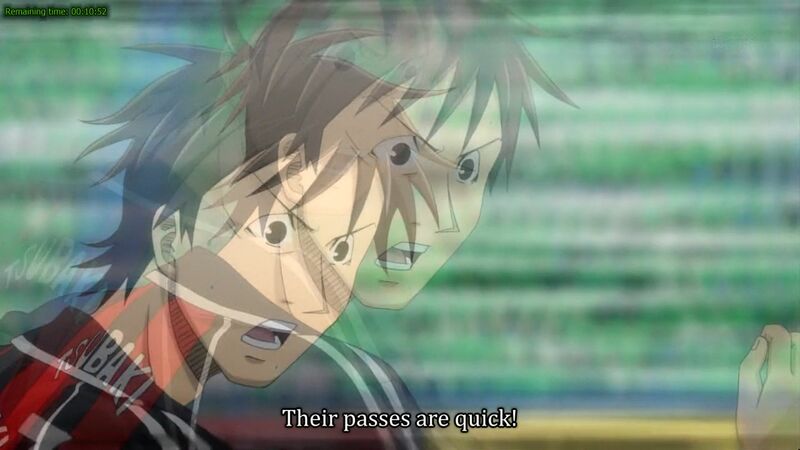 The blurry animation technique in action, resulting in one point deduction from this anime’s final score. 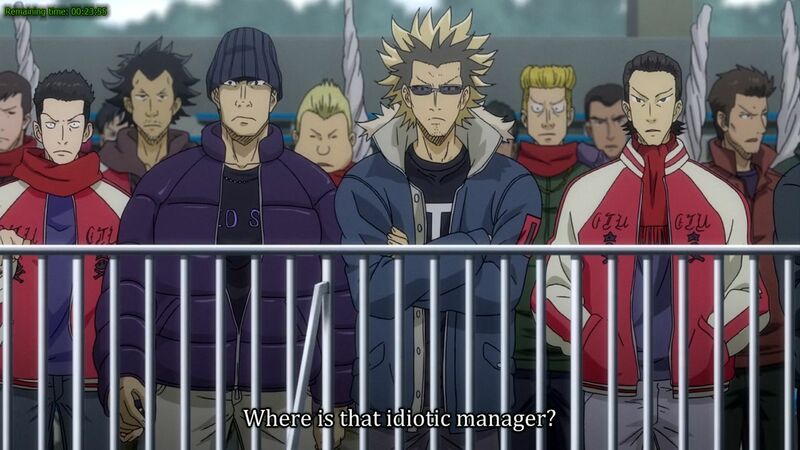 Really unhelpful considering that the sport genre handicap has also been applied to this anime. Unfortunately for this anime, in some action scenes especially in matches, the abhorrent blurry animation technique are used in this title. Therefore, in addition of the sport genre handicap, one point will also be docked from this anime final evaluation. Apart from that, the animation quality is decent enough, but it doesn’t integrate well with super smooth CGI animation quality, causing some awkward scenes where the mismatch of frame rates is easily apparent. Choreography is decent for a sport anime, thanks to the lack of over-exaggerated techniques. The directing is superb, being able to work well even in the slow pace of this anime. The frame rate mismatch is really apparent in scenes like the one above. The ball is computer-generated, while the player is animated traditionally. 8 out of 10. 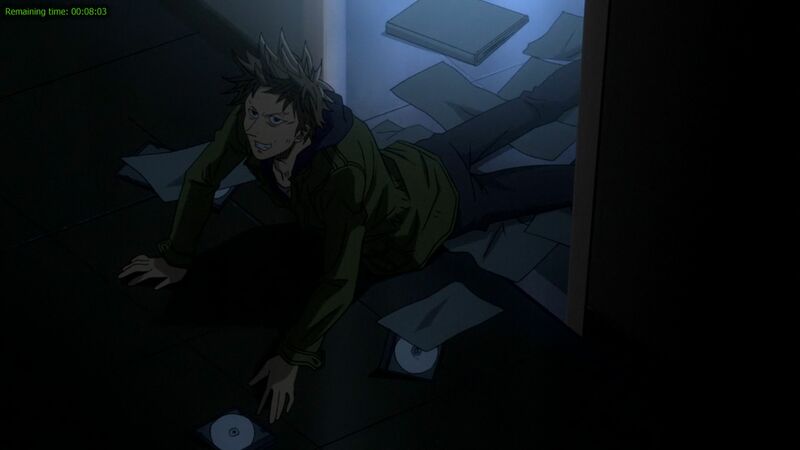 If only this anime doesn’t use the aforementioned blurry animation technique, the ‘Anime of the Year 2010’ would have had a new winner. I haven’t decided what title I will watch next, you will have to wait and see in the next review (hopefully will come in the near future). I’m pleasantly surprised to see that handbags swinging exists in J-League too, although I am concerned that J-League referees is too lenient for giving only a yellow for a straight red card offence in the Premier League. Well, this is my first post here…so, yeah, hello ! Overall, I agree with your review. You got most of your stuff right. Especially about comparing Tatsumi’s style (on and off the pitch) with Murinho. The overall rating was spot on too. 1. Screenshots posted in high resolution took a while to load. 2. 3-6-1 is NOT Dalgish style. They play 4-5-1. 3. I don’t believe the sports handicap applies here. Over at MyAnimeList forums and reviews, you could see lots of people that felt that this was a superb anime, even though they dont really know anything about football. 4. And finally, docking off a point for animation?!? It was one 2010’s best animations IMO.It is really hard to animate a sports anime, especially football, without frame recycling (you’ll understand why if you check out Captain Tsubasa and Hungry Heart Wild Striker). Sure, the ball’s CGI was a bit off, but it was still pretty smooth and never felt clunky anywhere. But, hey, that’s just my opinion, man. Hope I didn’t come across as a fanboy noob or something. I rated this one a 8/10 too. 1. MPC-HC saved the scdreenshots that way, and I am lazy to resize them. 2. In the early part of his current reign, Kenny Dalglish likes to play with 3 center backs, 2 marauding wing backs supporting the 4 midfielders more than the defence and one striker (especially when Gerrard isn’t around). Only after a few matches, did he uses 4 people on the backline. 3. The sport genre handicap is unique in this blog only. Here, anime titles that falls into either the romance genre (like Winter Sonata) or the sport genre (like this one) or both (like Cross Game) are judged to a higher standard than, let say, slice-of-life/comedy/shoujo anime titles. Therefore, if a normal action anime title managed an 8 out of 10 score, a romance/sport titles with comparable storyline (in quality) will only get 6 out of 10 score. That doesn’t prevent the likes of One Outs and Akagi from getting a perfect score of 10 out of 10 here though, therefore the storyline for a sport anime title simply has to be exceptional to get it. 4. I hate that blurry animation technique. I can accept scene recycling (seems to be rare though nowadays), but not that nauseating attempts at doing motion interpolation. I haven’t watched the the two titles you have mentioned, but if the likes of Ookiku Furikabutte, Over Drive, Cross Game or Aoki Densetsu Shoot get by without using the said animation technique, why can’t this anime do so? The general animation quality itself isn’t bad, and the mismatched integration of CGI and 2D animations is not worth penalizing this anime over, unlike that failed motion interpolation thingy.